The 6.4L Power Stroke engine was first introduced in 2008 as the eventual successor of the 6.0L Power Stroke in Ford Super Duty trucks. This engine was produced by International and was very similar to the International engine, Maxxforce 7. Although the 6.4L engine is quite similar to the Maxxforce 7, it was developed with some exceptions in tuning and performance to meet Ford’s more specific light-duty application. The 6.4L Powerstroke had a very short life cycle but was seen as necessary to improve on the problem-riddled 6.0L Powerstroke. 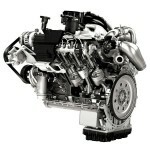 The engine was first introduced in 2008 model year Super Duty trucks and available through the 2010 Model Year. In addition to reducing problems, this engine was also developed based on new emissions levels required. In addition to the EGR system and the DOC added to the 6.0 L Powerstroke, this engine also was the first Powerstroke to utilize a diesel particulate filter (DPF). 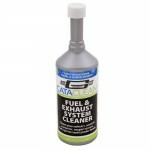 The addition of the DPF led to some issues, including worse fuel economy than its predecessor due to extra fuel required for “cleaning” the filter, but there were various issues encountered by all of the manufacturers. This engine did have a high-profile issue of flames coming out the exhaust which was seen under certain conditions during DPF regeneration. 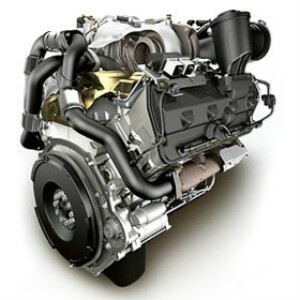 The addition of the DPF to meet more stringent emissions requirements drove broad changes for the Diesel business in general. As all manufacturers were required to add DPF technology, one problem existed; the sulfur content of the diesel fuel produced at the time would poison and deactivate DPFs. 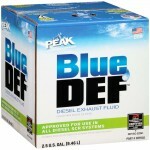 This led to fuel content changes, as diesel fuel was required to be reduced from 500 ppm of sulfur to a max of 15 ppm. One feature on this engine that contributed to its popularity was the strong performance achieved by using its sequential turbocharger setup. 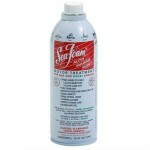 This allowed for good performance at both low and high engine speeds. The 6.4 liter engine, or 390 cubic inches for those more familiar with cubic inch displacement units, offered offered significant performance improvement over its predecessor. This would be expected based on its increased displacement and sequential turbo setup. The 6.4 offered 350 horsepower at 3000 RPM, 25 horsepower more than the 6.0L, and 650 lb-ft of torque at 2000 RPM, 80 lb-ft more than the 6.0L offering. The 6.4 came with a 3.87 inch bore and a 4.134 inch stroke. The 6.4L Powerstroke was built using a cast iron block and cast iron head. 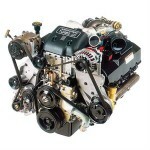 The valvetrain utilized for this engine was a traditional overhead valve (OHV) with camshaft in the block and push rods. There were a total of 32 valves, or 4 per cylinder, obviously made of 2 intake and 2 exhaust. The 6.4L Powerstroke co-engineered by Ford and International was a much needed engine to help for recover from the problems of the 6.0L, even though it was only available for a few model years. 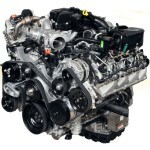 Editor’s note: This engine was the first Powerstroke to utilize DPF technology. Some other impressive qualities of this engine were the increased power and the sequential turbocharger technology, which was one of the key enablers for the power increase. This engine was ultimately phased out of the 2010 model year by Ford’s in-house 6.7L Powerstroke engine, which was created to meet the further restricted emissions regulation.